We survived the Indian bureaucracy relatively painlessly. It took them 6 hours to come out to us, but then Customs, Immigration, and Coast Guard all arrived pretty quickly. We wondered why they choose to come out to our boats rather than wait in their offices for us to come to them (which is what most of the world does). Turns out that they like to shake down the boats for booze and other refreshments. A big catamaran was obliged to give 2 bottles of wine, which, of course, makes it that much harder for the rest of us. Usually we offer refreshments to visiting officials, but here we only offered cold water, lest we look too rich. The next day we visited the Port Captain, which completed our entrance formalities. Then we wandered around town, reveling in the sights, sounds, and smells of India. 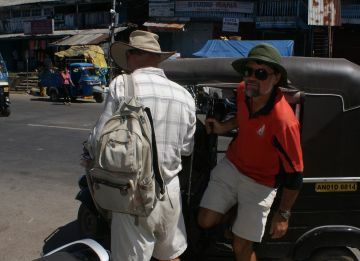 Little 3‑wheeled Tuk‑tuks are EVERYwhere, zipping to and fro and cutting each other off with gay abandon. Holy cows wander the streets. The taxis are all ancient Ambassador cars that look like they were built in the 50s (some probably were). And everywhere there is noise - horns honking for no apparent reason, music blaring from shops. All very colorful. As Dorothy said, "We're not in Kansas anymore." We had a pleasant surprise when we went to get new SIMs for our phones and modems. The Winlink system that handles these emails is run by volunteer Ham radio operators all over the world. There's a Winlink station in Chennai (Madras) and we've been in contact with the owner, Gopal, as that's where we're planning to go after the Andamans. 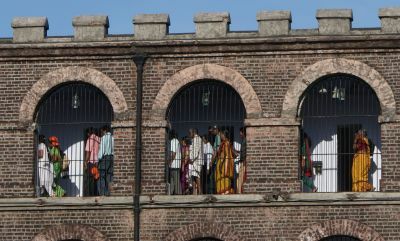 Although the Indians learned much from the British, they never adopted queuing. In the UK, if you stop to tie your shoe, when you get up you're likely to have 3 people lined up behind you. Here, everyone just crowds to the front and shouts, vying for attention. 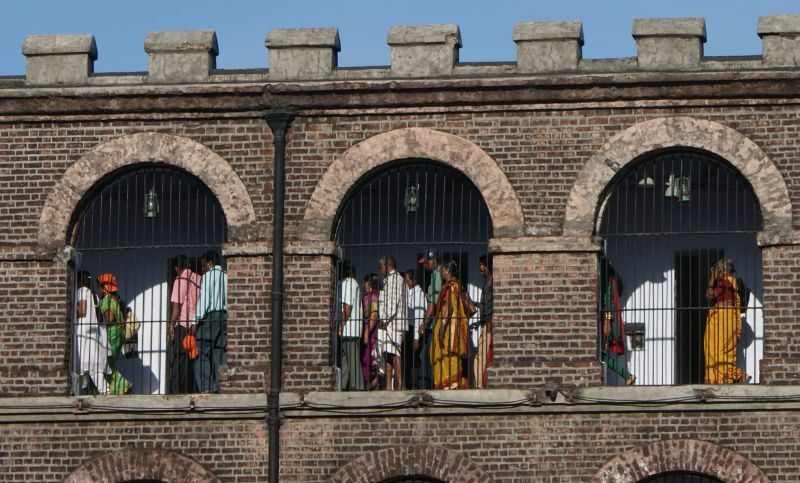 We spent the next day basking in the delightful pandemonium of India - wandering through town, visiting museums, poking into shops and stalls, bargaining with the vendors for fruits and veggies, visiting the "cellular" jail, and generally enjoying it all. Gopal took us out to lunch at a fancy hotel on the top of a hill overlooking town and the bay, so we got our first delicious tastes of real Indian foods. Our taxi driver knew of some PhD students who repaired our dive regulators and refilled our tanks, in case we want to do some diving. 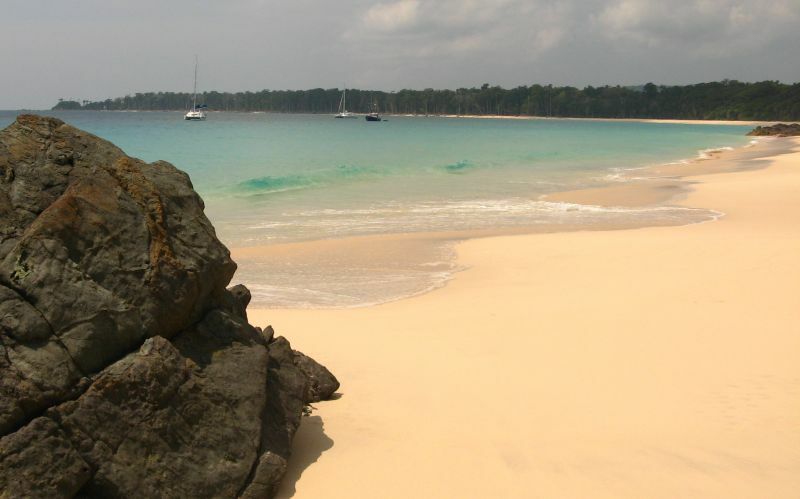 We're taking a clockwise trip around the Andamans. 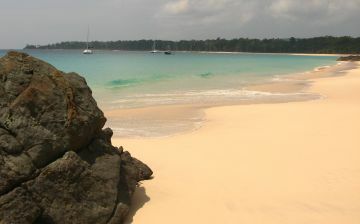 Our first stop was at Chiryatapu, at the southeast tip of South Andaman Island. It was Sunday so the crowds were out, playing their music, playing loud games in the water, and yes, honking their car horns. Then we continued further south to anchor between the Cinque Islands. We're not allowed to go ashore in many places but we're (apparently) allowed to snorkel, so we happily dove in. Unfortunately, rising ocean temperatures have "bleached" (killed) most of the coral, but we saw a school of 5' (1.5m) Hump-head wrasse feeding on the corals with their big, buck teeth. We stopped for lunch at the long beach at the south end of Rutland Island. Ashore we found several turtle-tracks, where they'd come up to dig pits to lay their eggs in. We also found some shell fragments, presumably from hatched turtles. Around the corner at the southwest end of Rutland we spent a much calmer night than we had at Cinque. Today we went out to the Twin Islands for the day. These are supposed to have the best coral around. Perhaps so, but it's still mostly bleached. We saw some live corals, so they're trying to come back. But the big excitement was the Manta Rays! These are basically a giant wing 6‑10' (2‑3m) across, with a huge mouth in the middle and gills on the bottom. They're filter-feeders, so completely harmless, but big and very majestic as they fly through the water. Sometimes you can see their black backs from above but mostly what you see are the tips of their wings breaking the surface. We saw several in the gap between the Twin Islands. Very cool! All of these locations should be visible at our Position Reporting page.